The Gion Festival: The best information on Japan's most famous festival. Kyoto’s extraordinary Gion Festival mixes deities, myths and legends with ancient history, culture and modern life. Long only understood by insiders, GionFestival.org introduces these magical elements to English speakers. You’ll appreciate why the Gion Festival is arguably Japan‘s largest and most famous festival, designated as a World Heritage Event by UNESCO. The chigo or heavenly child, nowadays only on the Naginata Boko float. 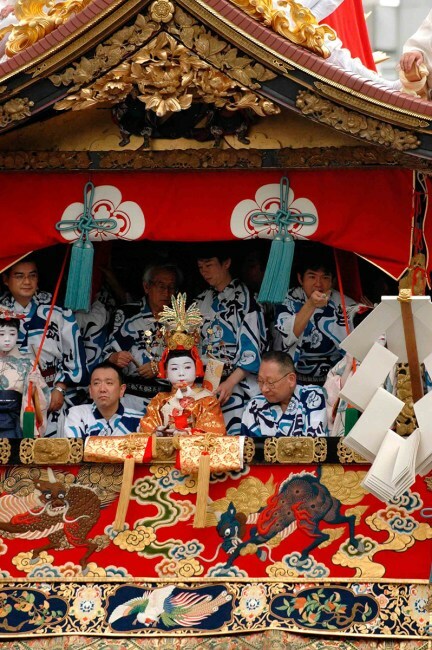 The Gion Festival’s history began in the year 869 C.E.. The Emperor called for a goryō-e ritual to appease angry spirits. He believed the spirits were causing a deadly plague in Kyoto‘s sweltering midsummer. These roots remain today: in many ways the Gion Festival is an enormous, month-long purification ritual. These include countless rituals and prayers for a year full of protection from harm. 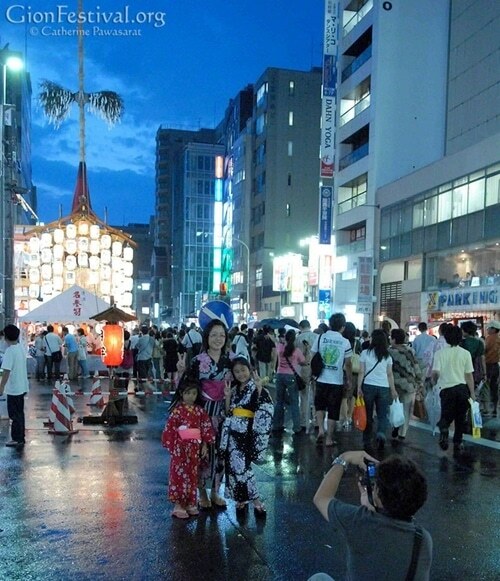 In other words, the Gion Festival invites goodness to Kyoto City, its residents and visitors. Although Japan is often stereotyped as a homogenous country, it’s spiritually very open-minded. That is, Japanese people and culture accept “whatever works” into their spiritual cosmography. 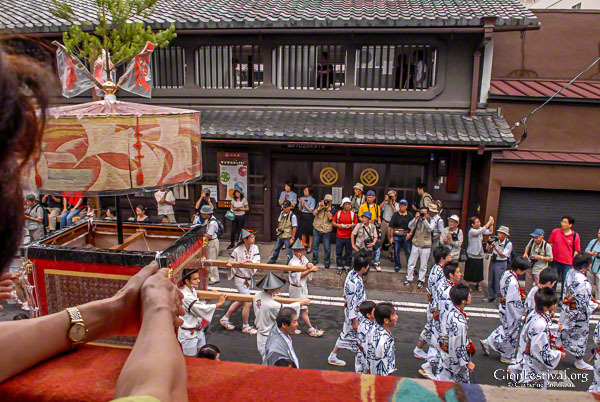 Consequently, the Gion Festival features an abundance of spiritual traditions. Look closely and you’ll see signs of Shintō, Zen, Mahayana Buddhism, Taoism, Christianity, Islam and Greek mythology. The Gion Festival is a neighborhood celebration that now welcomes more than a million visitors. With more than a millennium of rich history, the Gion Festival offers an excellent case study for sustainability. More and more, we’re recognizing the benefits of a longer view so we can live together well on this planet. And the Gion Festival has continued for more than a thousand years! So what can we learn from it and its community? Put on annually by thousands of volunteers, the Gion Festival is a fascinating self-organizing institution. What about the Gion Festival has made it so meaningful to so many people for so many generations? What makes it meaningful and worthy of our interest and support today? For over twenty years I’ve investigated these questions. Originally I could find little quality information about the Gion Festival in English. And so I explored the festival on my own, equipped with curiosity, inquiry, notebooks, dictionaries, cameras and audio recorders. The Gion Festival community has responded with hospitality, generosity, knowledge, love, commitment and humor. GionFestival.org offers you the fruit of our many shared hours together. May it enrich your experience of the Gion Festival! And may it help make sure that another thousand years of future generations benefit from its exquisite offerings. We offer you an eBook as a downloadable pdf reading solution. We’d like you to have access to the https://gionfestival.org/ content at your convenience, and we understand that you may not always have access to the internet. Once more we recommend you start with the top menu for a festival overview. Additionally, the 34 eye-catching yamaboko floats each have their own webpage. You can see those via the links in the sidebar at right. Or check out the webpages on the Gion Festival floats‘ two parts, Saki Matsuri (July 10-17) and Ato Matsuri (July 18-24). Enjoy!